If you’re a small-business owner, general business liability insurance is critical for protecting you from all kinds of unforeseen issues. One of the most notorious sets of claims are so-called slip-and-fall claims. Such claims can derail all the hard work and energy you’ve put in to your livelihood. Fortunately, insurance brokers can make sure you have the business insurance you need to be protected in these cases. General liability insurance is an important safeguard against a number of claim types. In addition to slip, trip and fall cases, small business liability insurance protects against property damage, slander and libel. It can also cover legal expenses incurred in defending yourself against these claims, including attorney’s fees, settlements, and awards. 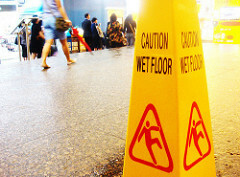 Slip-and-fall cases generally fall under the concept of “premises liability.” For a claim to be successful, the litigant must prove that a “dangerous condition” was present and that the owner knew of the condition. This dangerous condition must be one that created an unreasonable risk that the injured person could not have anticipated. This provides some leeway and protection for business owners; people still need to be aware of obvious dangers. To prove that the business owner knew about the condition, the litigant must show the owner created the issue, knew it was there and did nothing about it, or was in place for so long that the owner should have been aware of it and corrected it. Effective slip and fall accident prevention methods go beyond just clearing away clutter or placing a “Wet Floor” sign at a slippery entrance. Establish a program that addresses prevention, as well as employee response if someone does get injured. Do a daily safety check for common issues like exposed cables and wires, loose mats, greasy floors, ripped carpeting, burned-out lights, cluttered spaces, and warped floors. If an issue arises, immediately address it even before it can be repaired by putting up warning signs, blocking that area of your business, and arranging for it to be fixed quickly.Put handrails on all stairs and balconies, including those not in public areas. Keep walkways and floors clean regularly, using approved cleaning solutions and procedures. Teach employees about slip-and-fall issues. Draft written guidelines for how problems should be reported and what to do in case a customer is injured. Maintain outdoor areas such as parking lots, sidewalks, and doorways. Cracks, potholes, ice, and snow are all potentially problematic. Contract for snow and ice removal, driveway/parking lot repair, and landscaping maintenance. Repair uneven floors by releveling or recoating. 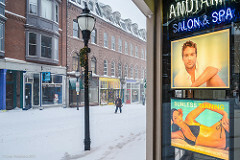 If leveling is not possible, use lighting or signage to alert customers. Track all of it. Document all your daily inspections, any maintenance work done (including when and by whom), staff training, and your policies and procedures. Work with a business insurance broker to make sure you have the right coverage to protect yourself and your business. It’s important to know the issues that cause slip-and-fall claims, how your insurance protects you, and what you can do to prevent such claims from being filed in the first place. For help with your business insurance needs, contact us today.